Khobragade’s departure from the US, State Department spokesperson Jen Psaki said, does not change the charges against the 39-year-old diplomat. 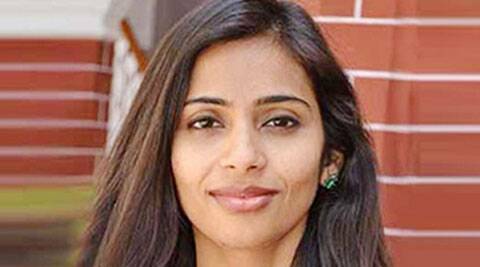 Expelled Indian diplomat Devyani Khobragade, in effect, has been barred entry into the US, with the State Department saying her name would be placed in visa and immigration lookout systems to prevent routine issuance of visa. Khobragade’s departure from the US, State Department spokesperson Jen Psaki said, does not change the charges against the 39-year-old diplomat. “Her name would be placed in visa and immigration lookout systems to prevent the routine issuance of any future visa and upon her departure a warrant may be issued for her arrest,” she said. From the comments made by the State Department spokesperson, it is clear that Khobragade is being virtually treated as a “persona non grata” and may be permitted to visit the US only to subject herself to the jurisdiction of court. On Thursday, Khobragade was indicted in a New York court on two counts of visa fraud and misrepresentation of facts. “The charges remain in place. There are processes that are standard processes in each of these cases, which we were abiding by throughout this process,” the State Department spokesperson insisted. Arrested on December 12, Khobragade was reportedly strip-searched and held with criminals, triggering a row between the two sides with India retaliating by downgrading privileges of certain category of United States’ diplomats among other steps. » She did not want to pay her domestic help required wages under US laws or protect her against exploitative work conditions mandated by US law. » She often made help work up to 100 or more hours per week without a single full-day off, which, based on promised salary of $573 per month, would result in actual hourly wage of $1.42 per hour or less. » After help fled in June 2013, Devyani’s relative repeatedly contacted help’s family in India, attempting to persuade her to return to Delhi and not report her experience. » In a July 2013 FIR, Devyani acknowledged she had agreed to pay help only Rs 30,000 per month, contrary to representations to US authorities. Legal proceedings were initiated against help in India.